Work is more enjoyable with chairs that support your physical and mental well-being. 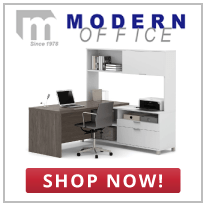 At Modern Office, we provide a variety of stylish office chairs built for the comfort of you, your employees, and your clients. Whether you need to furnish an office or lobby, rely on Modern Office for chairs designed to improve office productivity and morale. Office chairs come in a variety of styles and colors so you never have to compromise on finding furniture that complements the look of your office. Executive leather office chairs offer luxurious support while modern swivel chairs provide a bit of fun for employees and clients alike. Chairs come in white, black, brown, green, red, orange, purple, and blue, and customers can choose from chairs upholstered in leather, mesh and, fabric. No matter the style of chair you’re looking for, you’ll find expertly designed and durable chairs at Modern Office. Why purchase average computer chairs when you can invest in chairs designed for your ultimate comfort? Office recliners with adjustable sliding seats and footrests allow you to lean back and elevate your legs when you want to relax. Safely recline to a 45-degree angle or even flat from an upright position simply by pulling on a paddle. Chairs also come with deep cushions surrounding your torso for added support and ultimate relaxation. If you want to add a bit of sophistication to your office, consider purchasing a chaise chair, architects chair, or Chicago recliner. While more stationary compared to their swiveling counterparts, they provide plenty of comfort with soft, supple premier grade leather. Browse our selection of attractive reclining office chairs if luxury is what you’re after. Spending long hours at a desk without the proper seating can cause unwanted back pain as you slouch down in your chair, overstretching the spine and putting pressure on your muscles and spinal discs. It’s important to invest in office chairs that support back and spine health—ergonomic multi-shift office chairs help. Multi-shift chairs at Modern Office are designed to provide support 24 hours a day, seven days a week. They support up to 400 pounds and adjust to custom fit users of varying sizes. This is especially handy in workspaces like hospitals or call centers where employees work multiples shifts and sit for long stretches of time. Chairs include back tilt, seat tilt, and forward tilt options as well as height adjustments. Purchase ergonomic computer chairs to invest in the well-being of your hardworking employees. We’re a family-owned and operated furniture business that’s been serving customers worldwide for over 30 years. We understand the needs of our clients in a variety of industries and are prepared to help you find the best office chairs that support the well-being of you and your employees. Contact us today to invest in the productivity of your office with comfortable and supportive chairs.